An environmental hazard is a substance, a state or an event which has the potential to threaten the surrounding natural environment / or adversely affect people's health, including pollution and natural disasters such as storms and earthquakes. Human-made hazards while not immediately health-threatening may turn out detrimental to man's well-being eventually, because deterioration in the environment can produce secondary, unwanted negative effects on the human ecosphere. The effects of water pollution may not be immediately visible because of a sewage system that helps drain off toxic substances. If those substances turn out to be persistent (e.g. persistent organic pollutant), however, they will literally be fed back to their producers via the food chain: plankton -> edible fish -> humans. In that respect, a considerable number of environmental hazards listed below are man-made (anthropogenic) hazards. 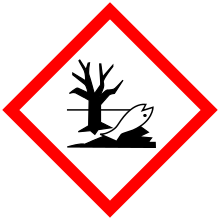 The international pictogram for environmental hazard. Chemical hazards are defined in the Globally Harmonized System and in the European Union chemical regulations. They are caused by chemical substances causing significant damage to the environment. The label is particularly applicable towards substances with aquatic toxicity. An example is zinc oxide, a common paint pigment, which is extremely toxic to aquatic life. Toxicity or other hazards do not imply an environmental hazard, because elimination by sunlight (photolysis), water (hydrolysis) or organisms (biological elimination) neutralizes many reactive or poisonous substances. Persistence towards these elimination mechanisms combined with toxicity gives the substance the ability to do damage in the long term. Also, the lack of immediate human toxicity does not mean the substance is environmentally nonhazardous. For example, tanker truck-sized spills of substances such as milk can cause a lot of damage in the local aquatic ecosystems: the added biological oxygen demand causes rapid eutrophication, leading to anoxic conditions in the water body. A physical hazard is a type of occupational hazard that involves environmental hazards that can cause harm with or without contact. Biological hazards, also known as biohazards, refer to biological substances that pose a threat to the health of living organisms, primarily that of humans. This can include medical waste or samples of a microorganism, virus or toxin (from a biological source) that can affect human health. Psychosocial hazards include but aren't limited to stress, violence and other workplace stressors. Work is generally beneficial to mental health and personal wellbeing. It provides people with structure and purpose and a sense of identity.